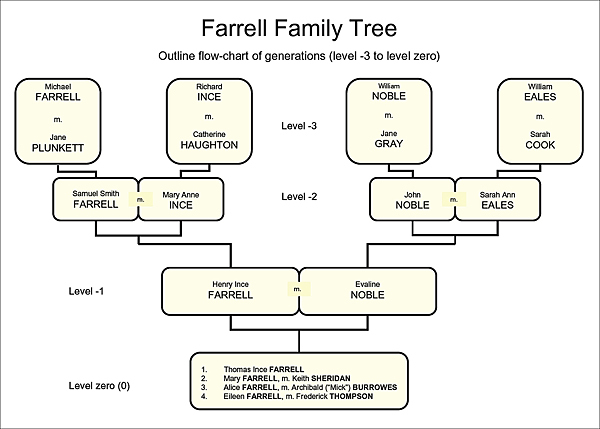 Some genealogy - my maternal antecedents: Farrell, Noble, Ince, Eales, and others. 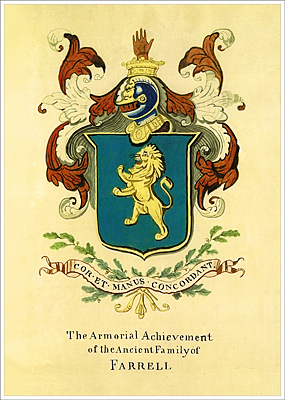 Following research of my mother's family and ancestors, I have produced with my son James a general narrative of the Farrell and the Noble families, being respectively the paternal and maternal antecedents of my mother Eileen Thompson (Farrell). It may be a fair record for family-members but probably will be of only passing interest to others. The latest revision is at July 2018 (version 7). One could continue endlessly with adding more detail, extending tree net-works and so on, but there is possibly little more of "meat" available so far as our immediate line of ancestry is concerned. Therefore there may be some more corrections and small additions to be made from time to time but no major rewrite. The narrative history consists of about 80 pages, and is available as a PDF document (large file). DOWNLOAD - "THE FARRELL FAMILY"
My paternal family - the Thompsons arrived in Australia from north-eastern England where in Sunderland my grand-father, William Thompson had married grandmother, Jane Softley, and with then three children in tow, they migrated to Australia, arriving in 1887. Prior to that, the Thompsons had been living in and around Middleton-in-Teesdale and were mainly employed in the lead-mining industry - a hard life. The Thompsons have already been the subject of genealogical research by my late cousin, Barbara Thompson, who produced a fine, detailed report of us all. In addition, a distant relative, Norma L Smith has written and had published a book: "The Story of a Lead Mining Family - The Thompsons of The Bell, Newbiggin, Teesdale" (ISBN 0 953074 96X) going back to earlier generations, and she finds that our family were derived from "Reivers" (= bandits) who came plundering from across the Scottish border.